It’s so cold this morning! The temperature is -1 right now, but thankfully the sun is shining. Most local schools have been cancelled because of the cold, and my activities for the day were also cancelled (Bible study this morning and youth group tonight). I’m not certain about the punctuation, but the words and the meaning are there. I memorized the song version which is slightly different from the NIV, but the meaning is the same. It’s been cool to see how the truths in this verse line up with other things I’m reading, and I will continue to focus on this verse for the rest of the week! 1- Sing it. Whenever possible, I like to memorize verses in song form. The verses I want or need to memorize don’t always come with a song, but when they do I get excited because it raises my chances of success. I’m not a songwriter (although I wish I possessed that skill), so I don’t create my own melodies for verses. I know people who do, though, and I say good for them! Anyway, this is why I love Seeds Family Worship– they have helped me learn a good portion of the verses I know. When I can be meticulous about this, I am. I’ll listen to the song on repeat a few times until I can sing along to all the words, then listen to it a few times each day so it gets into my head. I like listening to a verse song in the car, especially when running errands because each trip only tends to last the length of one song anyway. 2- Write it. This one can involve some time, but not a lot. I like to take a blank piece of paper and write my verse out in big letters, tracing over important words to emphasize them. I have also tried opening a blank document and typing the verse out multiple times, but I enjoy hand-lettering more. I also might draw little pictures next to words that are hard to remember, and I also use pictures for verses that contain lists of words. I did this with James 3:17, “But the wisdom from above is first pure, peaceable, gentle, open to reason, full of mercy and good fruits, impartial and sincere.” You don’t have to draw a picture for every word, just the ones that lend themselves to it. 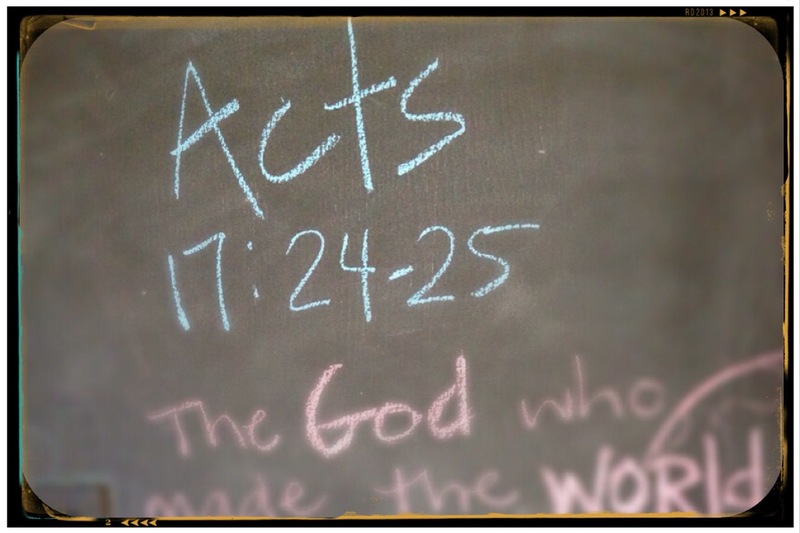 I will also sometimes write my memory verse on my chalkboard, which is in my kitchen. It’s fun to decorate the words or use different colors, and I spend a lot of time referring back to the written or typed verse as I go. Once I start to learn the verse I will quiz myself by writing or typing it from memory and seeing how accurate I can be. 3. With a group (or not)? Act it out! I kind of want to say this is just for kids or groups, but it’s always okay to be a little silly for a good cause. I do this sometimes with my high school girls. There was a verse (Romans 11:33) that had some easy-to-mix-up words, so we acted them out a few times to help us get the order right. It was helpful, fun, and may have even helped bring our walls down before getting into our lesson. 4. Look at it. I have often taken a picture of a verse card with my phone and set it as my phone’s lock screen. I have also used photo editing apps to create a digital image for my lock screen. I am afraid to count how many times I look at my phone each day, but it’s a lot, so this is a good trick. I mentioned my chalkboard above, which involves writing, but after that it’s just a matter of visibility. My chalkboard is in a high-traffic area, so I see it whenever I leave the house, come home, go downstairs, or do dishes. Sometimes I see it without really reading it, of course, because my mind is focused on other things, but it’s a nice visual reminder that it is there. I know people who like to post a verse on the bathroom mirror or next to their bed, too. I think that’s a great idea, but I am prone to clutter so it’s a stumbling block for me. I would never erase or throw away my verses! In all of this, do what works for you. 5. Just say it. When you’ve seen your verse, or after you’ve sung it, or just any time, try saying it to yourself aloud or in your head. Get as far as you can without looking. 6. Team up! I don’t always do this, but it is very effective. I’ve worked on memory verses with my peers in adult small groups, I’ve taught one per month to a preschool class, and I also challenge my high school girls to memorize one each month. With peers and students you can practice saying the verse together or you can send out some quick encouragement as you work toward a common goal. With young children, I like to start with having them repeat a few words at a time after me, then I lengthen the amount they are repeating back. Once a couple of kids have the verse down we recite it all together, and anyone who’s behind usually catches up pretty quickly by listening to the others. Being the “teacher” always encourages me to stay a step ahead- bonus. If you have tried-and-true methods for memorizing Bible verses, please share!